Update - 2009-11-30: Stockton Turner LLC aka Stockton Turner & Company filed for Chapter 7 Bankruptcy on 2009-11-25, nearly a month after the company suddenly closed its doors. In its petition, the Maitlin, FL-based company indicated that "after any exempt property is excluded and administrative expenses paid, there will be no funds available for distribution to unsecured creditors." Total assets are listed as $524,199.49 with $501,983.15 in liabilities -- all of which are categorized as "unsecured." Included in the debt is nearly $286,000 in "priority unsecured claims" described primarily as "Manager bonuses." Click here to view the 72-page filing in its entirety. Update - 2009-10-29: We have received new information that corrects certain things we previously reported about Stockton Turner & Co. While John Sarris did formerly manage a branch office for Stockton Turner & Co. that operated under the fictitious name "STS Lending" as per State records, it was not a wholesale operation nor should it be confused with "STS Lending Corp." which is a separate entity with no connection to Stockton Turner's operations. 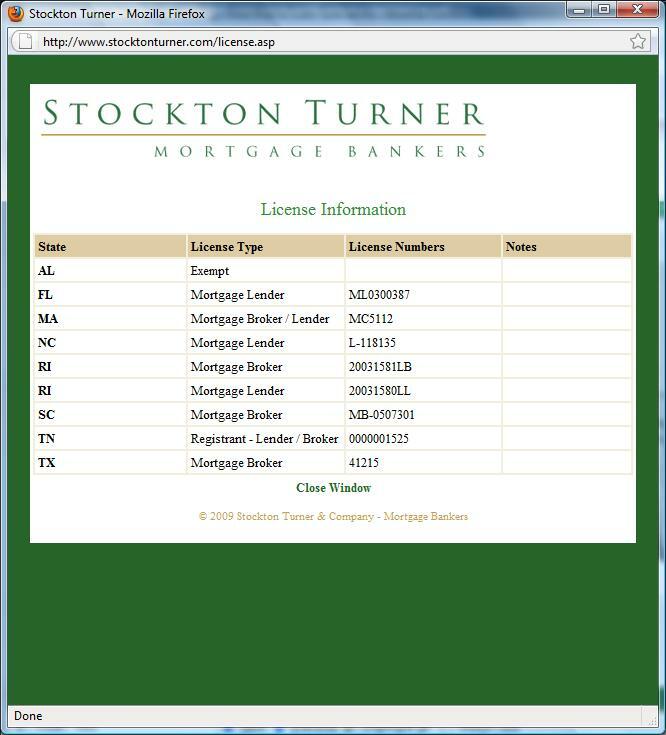 Stockton Turner & Co. terminated its ownership registration of the fictitious name "STS Lending" per a 2008-08-11 filing with the State of Florida, and had no connection with Sarris' new company "STS Lending Corp." or its partner "Home Team Equity." "It is with extreme regret that I advise you that Stockton Turner LLC will be closing as of September 30, 2009. As most of you know personally, loan volume has been dramatically reduced and even with over 90% of the corporate staff being laid off and the remainder having salaries and hours dramatically reduced, we have continued to lose money on a regular basis. As a result, all employees effective termination date will also be September 30, 2009. You may continue to close any loans that are committed provided they close no later than September 30, 2009. If you have any loans that are approved but will close after that date, you may transfer those loans to a lender of your choice." "As you were advised yesterday, Stockton Turner will be closing today at 5 pm, however we will have a "skeleton" staff on hand next week. While we are unable to provide you with all the pertinent details and procedures that will be applicable to each of your questions we can advise you as we are advised by the Bankruptcy attorneys and trustees." We were told the BK was filed the morning of 2009-10-01, but it does not appear in public records as of the date of this posting. Also unconfirmed are scattered reports of employees showing up at the corporate office demanding to be paid, only to be escorted off the premises by police. Local authorities were called to the premises on 2009-09-29 -- the date of the first memo -- responding to a report of a "suspicious person or vehicle" but there was no additional information on record and an official report was not made. Based in Maitlin, FL Stockton Turner & Company also did business as Stockton Turner LLC (view snapshot). They were a broker/lender and net branch operation with "over 135 offices in 17 states" and a "staff of over 500" per the "About Us" page on one of their web sites (view snapshot). The primary web site shows licenses in 9 states predominantly along the eastern and gulf coasts (view snapshot). Residential mortgage originations reached an average of $11.7 million per month in 2006, falling to $6.9 million by 2008. Data on commercial business was not available. The company reportedly had a wholesale operation up until a couple months ago according to our sources. [Editor's Note: Additional information here has been removed and/or corrected; please refer to the updated info above.] Stockton Turner's CEO Douglas Turner could not be reached for comment. Feel free to add your comments below or send us an email if you can provide additional detail.